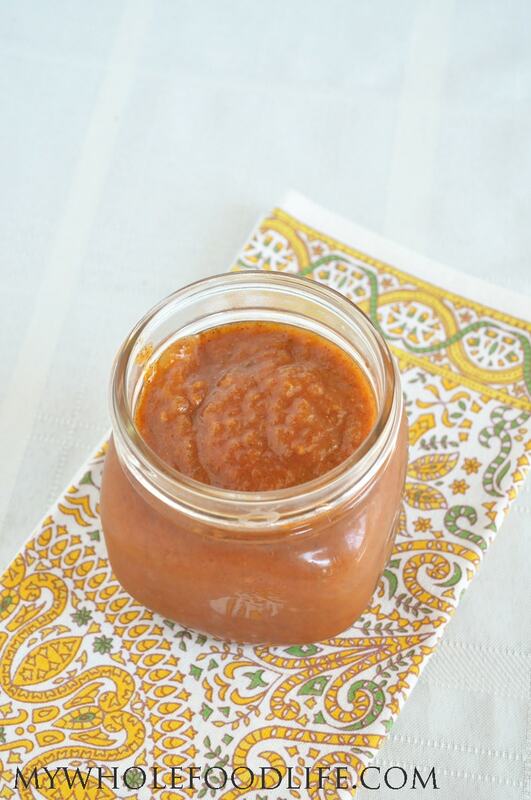 Homemade Enchilada Sauce that is vegan too! My husband does a lot of the savory recipes for this blog. This homemade enchilada sauce recipe is all his. 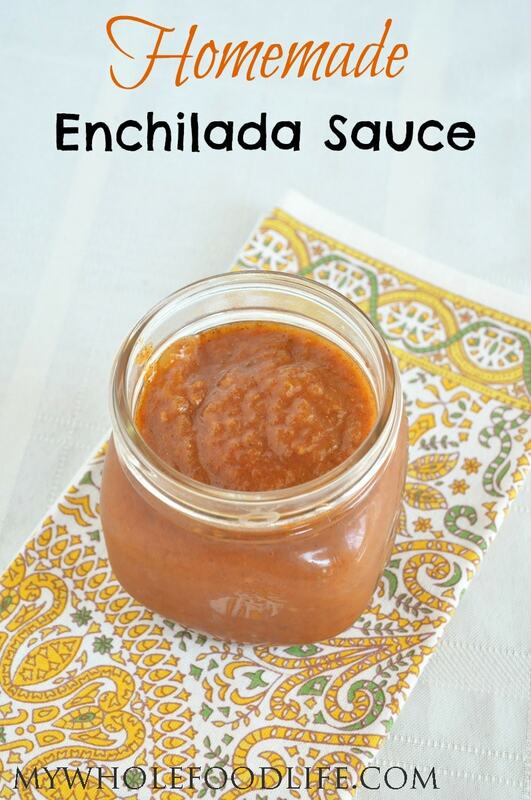 This vegan enchilada sauce is super easy to make. It’s packed with flavor since we roasted the tomatoes prior to using in the sauce recipe. Not only does this homemade sauce taste delicious, it will make your house smell amazing too! Most store bought enchilada sauces contain unwanted additives and also processed sugar. This sauce recipe containes neither! Some of the other recipes my husband has created are the Peanut Noodle Stir Fry, Sweet Potato Chili and Pumpkin Enchiladas. This enchilada sauce is vegan, gluten free and paleo approved. This sauce recipe makes a big batch and freezes well. I hope you enjoy it. You will never need store bought sauce again! Core about 10 large heirloom tomatoes. Brush the tomatoes with oil and place on a lined baking sheet . Remove the skin of the tomato. You can save the skins for homemade vegetable broth . Once they are cooled a bit, puree the tomatoes in a blender until smooth. Pour the pureed tomatoes in a sauce pan. Add all the spices into the pan and stir. Cover the pan with a lid and let simmer for 2 hours on low heat stirring occasionally. At the end, stir in arrowroot to let thicken. This is great! Have you ever tried to can this or freeze it? Thanks! It can be frozen. I have never tried to can it, but I am guessing it's possible? Why do you say cook time 1 hour when the tomatoes roast for an hour and then the sauce simmers for 2 hours? Looking forward to trying this! Oops. I guess I wrote that wrong. We roasted the tomatoes the day before using it in this recipe. Yes roast for an hour and then let the sauce simmer for 2 hours or so. Curious, could you cook it in your slow cooker or pressure cooker rather than simmer on the stove top? I seem to burn anything that has to simmer for a long time. I would love to try this. I don't see why not? If you try it, please report the results. I may try that next time too. While I haven't made this recipe (but I plan to! ), I make my own spaghetti sauce, tomato sauce, totem, etc. If you want to pressure can this sauce, don't cook it down quite so much, as it will thicken up some in the pressure canner. Could you use other types of tomatoes? I am just venturing into these type of recipes and cooking is not my passion :) but I want my lifestyle and my four kids to be healthy. I work and between sports and homework and other activities, time is limited. I love the idea of making my own sauces without salt and other additives, but could I start with canned tomatoes to save a time-consuming step? Is it possible to find a healthy, salt-free version or is anything canned from the store automatically bad? Thanks for your input as I try to make the best decisions that will fit my chaotic life! Would regular sugar work just as well as the coconut sugar? And if so, what would be the conversion amount? Thank you!